The Long Island Motor Parkway bridge over Clinton Road is approximately 500 feet north of the Stewart School. 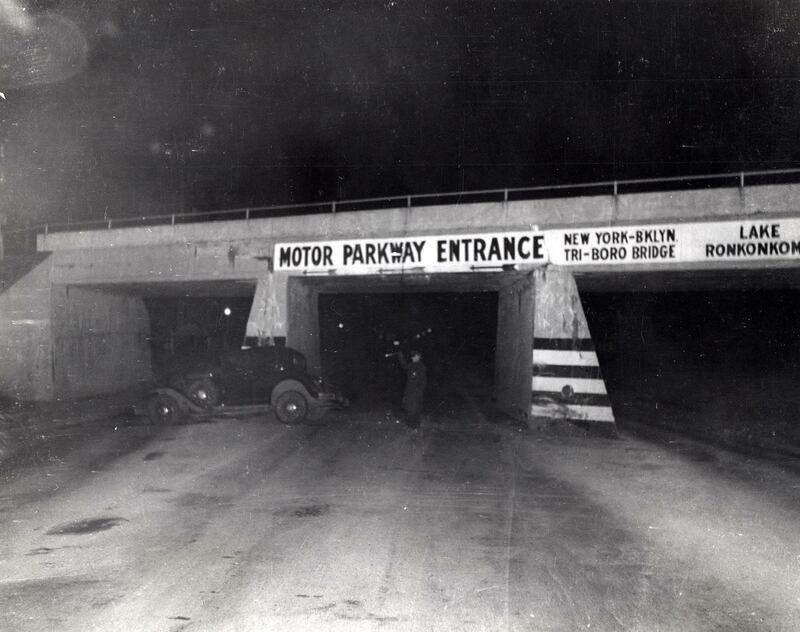 This bridge was one of only two in Nassau County with three openings; the other was over Westbury Avenue in Mineola. Note the sign indicating the entrance to the parkway via the Garden City Lodge. The image is courtesy of Ron Ridolph. Elizabeth Ernst, wife of the toll collector, is shown here outside the lodge in 1935. The Ernsts purchased the lodge, approximately 100 feet east of the Clinton Road bridge, when the Motor Parkway closed in April 1938. It was their home until the 1970s.The image is courtesy of Walter McCarthy.